There’s been a small flurry of conversation following the TV item on cycling safety last weekend. No matter what the particular cycling issue being reported, it doesn’t take long for the commentators to come out of the woodwork and state that cyclists (you know, that strange breed separate from all other humans…) don’t do themselves any favours by breaking laws left, right and centre. One of the transgressions that really gets up their goat is not stopping when they should, at STOP signs, pedestrian crossings, and particularly at red traffic signals. Surprisingly, only a few studies have looked into the actual prevalence of this problem. One study in Australia surveyed over 2000 riders and asked for details about their behaviour – over a third (37%) said they had ridden through a red light at some time when they were riding. 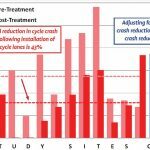 More recently, an observational study was carried out in Auckland, including >600 cycle movements, to better understand red-light running behaviour. Interestingly it found only ~4% of cyclists running conventional red lights when opposing traffic was going, but quite a reasonable proportion used pedestrian phases (e.g. Barnes dances) to get across the intersection before the traffic. Surveys of cyclists also found that particular movements like a lefthand turn or across the top of a T-intersection were most likely to be done on red. Riding across a Barnes Dance: it’s only pedestrians, so it’ll be OK? Motorists break Rules (and endanger me) all the time, so why should I obey the Rules? Interesting… but, nah, I don’t buy it. As I said before, many of these justifications won’t wash with any motorists observing your behaviour, thus chalking up one more black mark against those “cyclists”. Cycles are still legally “vehicles” and as such have to abide by all road rules applicable to other vehicles (like STOP signs, red lights) unless otherwise stated. I don’t think you can really claim a valid safety reason for ignoring these; it’s convenience in much the same way that motorists often break rules (and if you want to know how to get detected at signals, read our previous post on this). It is possible to legitimise some “free bypass” behaviours by engineering means, and we even have a couple of good examples in Christchurch for left-turns and top-of-T’s. But if they’re not there, don’t take it upon yourself to create your own “bypass”. There have been a few efforts around the country to encourage better riding behaviour. 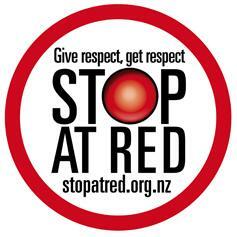 CAN ran a “Stop at Red” campaign a couple of years ago, courtesy of the Road Safety Trust. 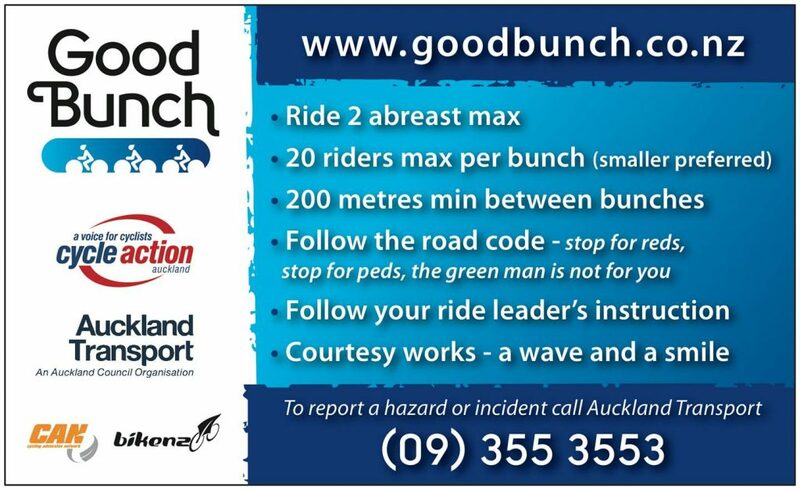 Another campaign “The Good Bunch”, developed by CAN/BikeNZ and local riders in Auckland, focused on improving the behaviour of bunch riders, including stopping when required at intersections/crossings. And educational initiatives like Wellington’s Friendly Cyclist also encourage riders to do the right thing. While they’re all relatively modest campaigns, they do prove useful to mention when in a meeting with someone griping about cyclists constantly breaking laws – at least an effort is being made. The debate is likely to continue on this issue (certainly many motorists won’t shut about it…), but it one of those things that at least we can do something about ourselves to improve the perception of “cyclists”. Do you stop at red lights and STOP signs? Why or why not? When turning left, if I know the lights are going to take a while, I will dismount, walk around the corner and set off again. I mainly do this whilst commuting just to make a point with all the queued cars. That point being 2 fold. 1: I can do this without breaking any rules and 2: not all cyclists run red lights. Went through a red the other day and sorry but I’d to the same again … the lights hadn’t detected me and there were no cars coming to assist. After some time of nothing coming up and down the T I was at, I just went. Don’t think it offended anyone and saved me a few minutes of waiting in vain feeling really stupid waiting for ….nothing. To be fair mostly this does not happen – the problem here was that the detectors were mid car lane and not in the cycle lane. I do agree we need to stop at reds and at pedestrian crossings but must admit that on a bike I have trouble waiting til the pedestrian is completely off the other side of the crossing before I take off again. It would be nice if more T Junctions allowed bikes to go – expecially where there are cycle lanes. There are three places where this Happens in travelling up Halswell Rd – Lincoln Rd and Hagley Ave and again I just feel stupid stopping for no good reason. Surely it can’t be that difficult to rig up a sign that says Cyclists can cross on red? In Paris cyclists are allowed to treat red lights as if they were give way signs. A very sensible policy which has resulted in 0 cyclist deaths for a second year in a row. I used to routinely run red lights, but to support the “stop at red” campaign I don’t any more. BTW, is there anything illegal or unethical about dismounting to cross with pedestrians, or dismounting to bypass red light when turning left? In the interest of forging good motorist/cyclist relations I stop at all red lights , unless there is no vehicle in sight and the wait is getting ridiculous . Have been known to use the pedestrian walk option , but somehow feel a bit nervous . Would love to see more green hook turn boxes to use in conjunction with a pedestrian crossing and can think of a couple of places that where they would be very helpful . Good point about Paris. As in Germany, know one has any problem with a red being used as give way. It is New Zealand drivers, not other factors. also like to point out in the 25 years of cycling around christchurch i would just point out that my anecdotal evidence is that from the 7 or so times i’ve been hit by cars- 2 times were by a car rear ended me while i waited at intersections. Also i’ve had many many close calls and near death experiences (such as a red light car runner) when crossing intersections with the lights (green) often by cars right turning through traffic and jumping behind other cars – then i have ever had going through redlights (never ever had a close call) . So while the law might say its wrong my life is more important. Its a dangerous place at intersections for cyclists – when they can cross safely then they should cross. In the UK it’s much safer to go across on red. I’m incredibly considerate to pedestrians, and it’s making me a lot safer, so I’m going to keep on doing it. The number of people we have killed by lorries here would definitely reduce if people didn’t wait around at the lights and get squished as the lorry turns. I realise what you’re trying to do, but there are a lot better things to start a campaign about. Interestingly the Auckland study referred to suggests that allowing cyclists to go on a pedestrian advance green-man or Barnes dance (subject to due care of course) might be a way to go. We have a cycle safety issue with trucks here too, but I’d say that ignoring at red is hardly the solution (or the real problem). It’s the material for another blog post one day, but the general gist with trucks should be either (a) position yourself quite clearly in front of them beforehand or (b) wait behind them until they move off. Not sneaking up the lefthand side, esp. if they’re moving (or likely to) would be my take-away message. P.S: not trying to start a campaign on stop at red; just another useful thing for people cycling to think about (and discuss!) – got plenty more where that came from! D***k – , 4%er whatever I’m not going to modify my behavior in the interests of petty jealousy. It’s motorists who seem to think bikes are illegitimate vehicles,a nuisance not worthy of their patience who need educating. I encounter such motorists about once every 3.5 hours of commuting, yet in 40 years of driving I can only recall seeing one cyclist (a helmetless skinhead riding like he’d stolen it in town) so dangerously flouting the rules. If they hit you they can just claim cycle blindness and the muppets cry HI-Viz. Become a pedestrian and join in the Barnes Dance. As a cyclist, simply dismount, wheel your bike across the intersection with the other pedestrians, re-mount and away you go. No laws broken there. Roadies might not like that idea as its not so easy to walk with road cleats. Having said that, how easy would it be to add a green bike sign next to the green walking man, to show that bikes can also proceed before the motorised traffic. There are so many places where pedestrians get a couple of seconds head start over the traffic to make them noticed. I travel passed University every day and the following intersections all have pedestrians crossing in advance of traffic: Straven/Kahu, Kotare/Clyde, Creyke/Ilam. You don’t need a driver’s licence to ride a bike. But I don’t want to lose mine or earn demerit points for doing it wrong. Previous Previous post: Cycling News from Across the Ditch – Perth.